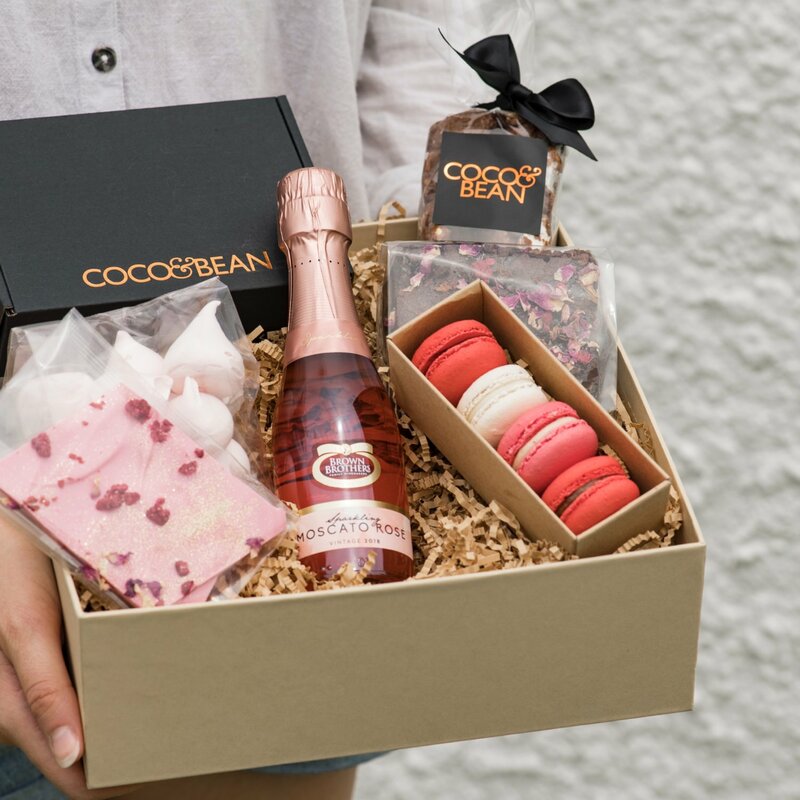 Valentine’s Day has been around for centuries and at Coco & Bean we want to celebrate its rich history, by delivering to you and your loved ones a very special collection of unique gifts. Believe it or not, Valentine’s Day is thought to have been an extension of the Roman festival of Lupercalia, a celebration of fertility. It later became known as a Christian festival in honour of Roman priest (and Saint) Valentine of Terni, who defied the order of the emperor and secretly married couples so that the men wouldn’t have to go to war. We love that there was a rogue priest helping lovers stay together! The romance aspect of Valentine’s Day ramped up in the 14thcentury when poet Geoffrey Chaucer wrote a love poem to celebrate the engagement of England’s King Richard II and Anne of Bohemia. Fast forward to the 18thcentury, and people were celebrating St Valentine’s Day by giving gifts and homemade cards. Chocolate had to be in the mix! Richard Cadbury, of the famous Cadbury chocolates family, is credited with creating the first Valentine’s Day candy box. He used his own designs and produced heart shaped boxes decorated with roses and cupids, filled with delicious chocolate. Great idea Richard! At Coco & Bean, we want to bring the original romance of Valentine’s Day back. This is why we have created the very special Love Story Collection – unique, delectable gifts for him and her, the perfect way to say “I love you” on Valentine’s Day. While flowers are beautiful, nothing conveys how special a person is more than sweets that have been baked with love especially for them. 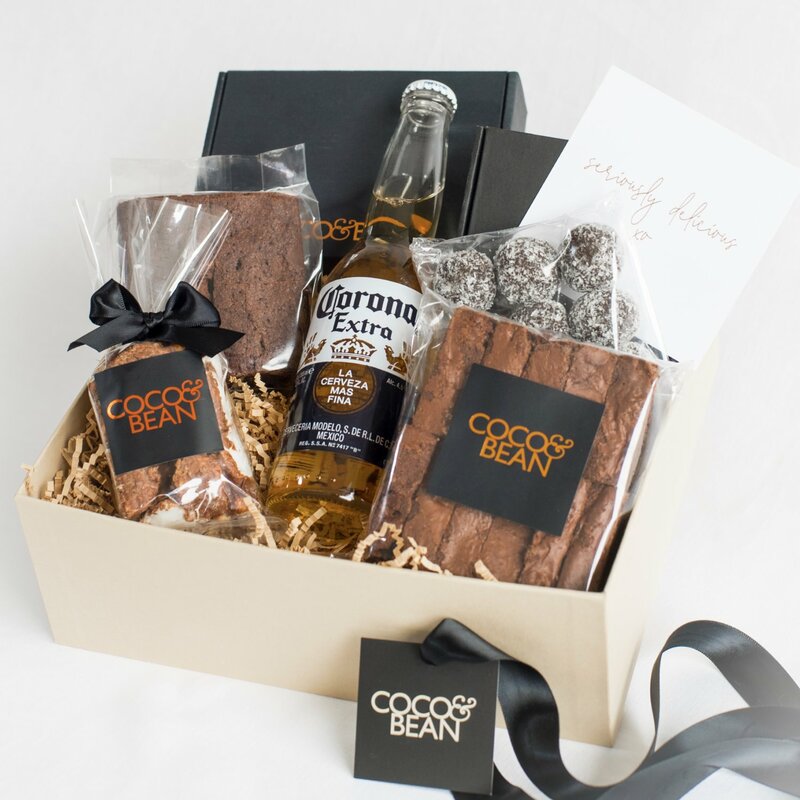 Those receiving a Coco & Bean gift will instantly know that you haven’t sent them a typical online chocolate hamper – they are receiving parcels of indulgence handcrafted with love and produced in small batches. We pride ourselves on creating beautiful treats, with the finest ingredients we can source. And once a person tastes a delicious Coco & Bean treat, they instantly fall in love…and become part of our beautiful love story. We are very proud to bring you this delightful collection of Valentine’s Day hampers and gifts for the people you love most – girlfriends, boyfriends, wives, husbands, mums, dads, friends and secret crushes. Nobody can resist a great Love Story! You’ll also be thrilled to hear that these unique handmade gifts are affordable and come with FREE shipping Australia wide. This is the Valentine’s Day gift for her that is sure to impress. 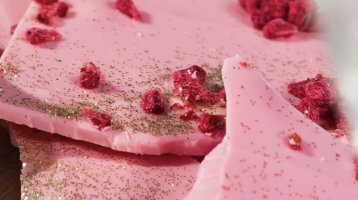 Beautiful French Macarons, our very special and unique Belgian Chocolate “Raspberry Rose” Brownies, gorgeous Belgian Chocolate Bark, delicate Vanilla Bean Meringue Kisses and Sparkling Rose Moscato. 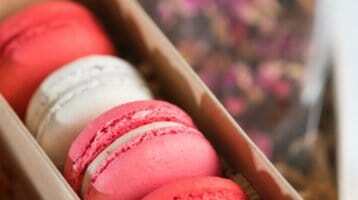 Desserts handcrafted with love and packaged with care to show her how very special she is. 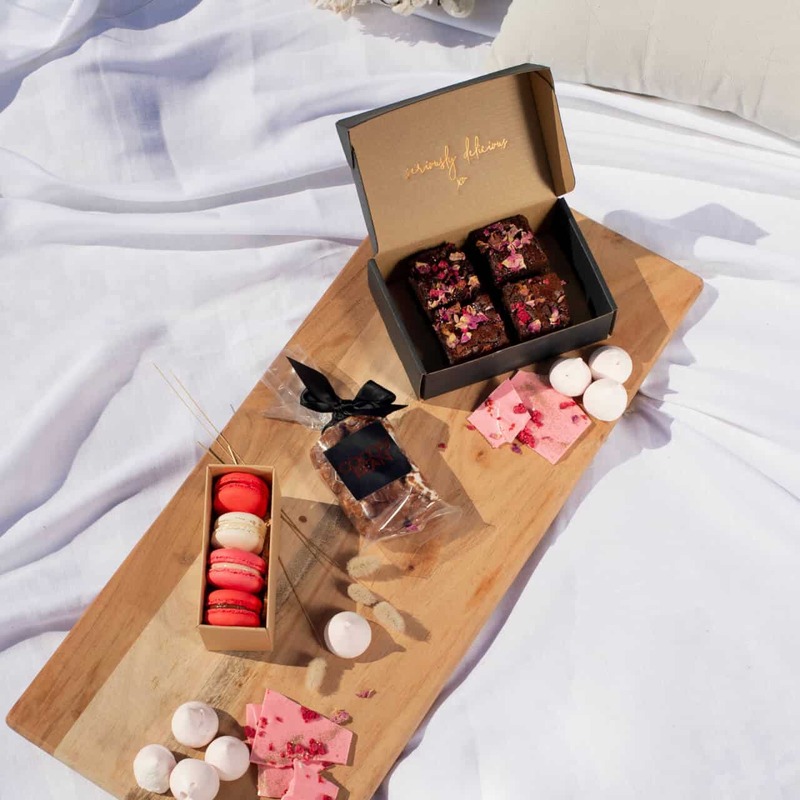 Like the original Valentine’s Love Story, the Coco & Bean Collection also caters for men’s Valentine’s Day gifts with a special hamper just for him. This Valentine’s gift includes our irresistible Belgian Chocolate Brownies, delicious Chocolate Brownie Biscotti, indulgent Belgian Chocolate Rum Balls, Belgian Chocolate Rocky Road and a bottle of Corona Extra Beer. You’re sure to win his heart with this unique Valentine’s gift. We are delighted to introduce the Brownie Flavour of the Month for February – Raspberry Rose. Perfect for chocolate lovers and Valentines, they have to be tasted to be believed. 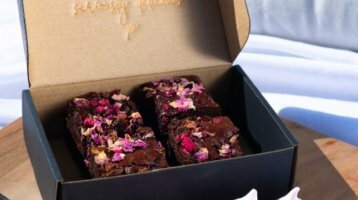 We’ve taken our seriously delicious chocolate brownies that you all love and paired them with fresh raspberries, delicately infused with rose water and topped with freeze dried raspberries and a crown of the prettiest rose petals you’ve ever seen. A work of art that will send your taste buds to heaven…and sure to win the heart of your true love. So there you have it. 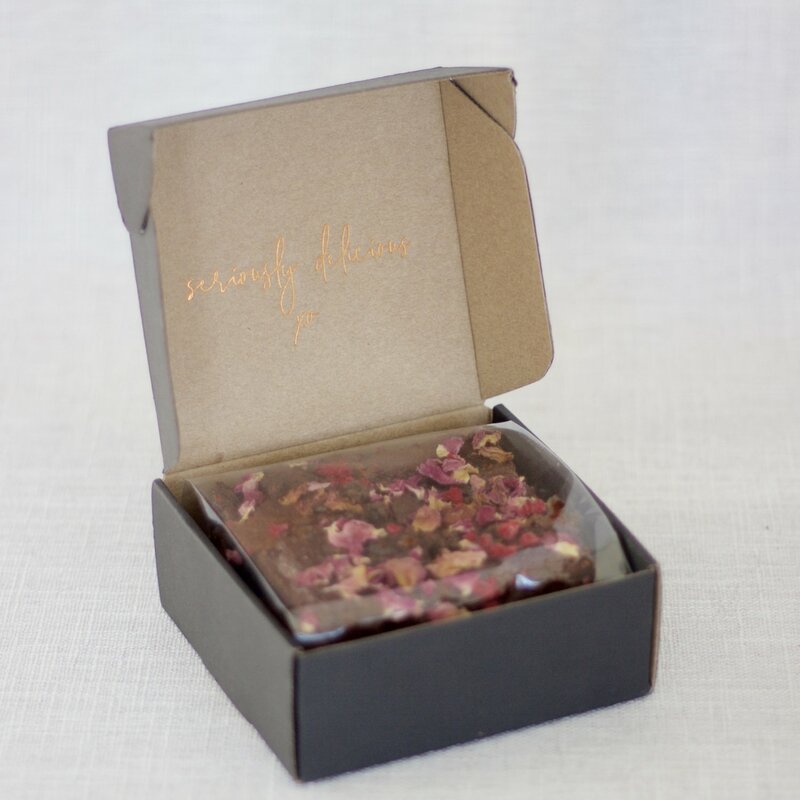 There’s no love story more true than our love story of creating Beautiful Sweet Gifts! We hope our Love Story Collection becomes a special part of your own love story.